“A grim and gritty fantasy noir with razor-sharp humor. I loved it!” – Tim Waggoner, author of TEETH OF THE SEA. Published by Gryphonwood Press (February 2018). Steven Hines listened to the city and the city spoke. Cleveport told him she was sick. With his unnatural connection to her, that meant Hines was sick too. But when his friend, Detective Abby Jones, comes to him for help investigating a series of deaths with no discernible cause, Hines can’t say no. Then strange fungal growths begin to appear in the streets, affecting anyone who gets too close, turning them into violent lunatics. As the mayhem escalates and officials start to seal Cleveport off from the rest of the world, Hines knows the trouble has only just begun. SAMPLE: Read the first three chapters here. 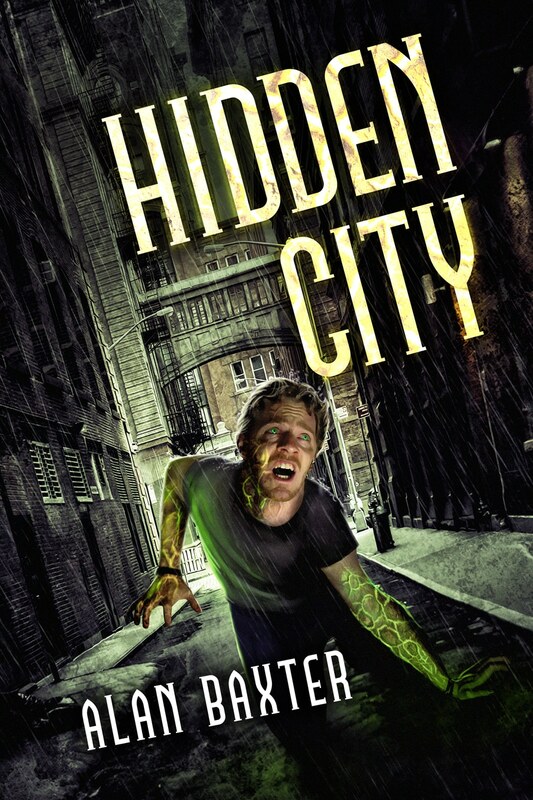 “Hidden City is a delicious supernatural noir, the song of a city of the lost with both Chandleresque and Lovecraftian undernotes and distant echoes of Jim Butcher’s Harry Dresden. But it is very much its own thing, razor sharp, dark, compelling, cosmic and strangely touching all at once. Highly recommended.” – William Meikle, author of The Ghost Club. “Sweet baby Cthulhu, Baxter brings the skin-crawl. This was a book that managed to keep me uncomfortable for most of the read. My skin crawled, my scalp prickled, and I was always just on the verge of putting the book down and doing something else to give my overactive imagination time to die down… Hidden City kept me guessing. I truly didn’t expect it to end quite the way it did. I was over-the-moon about it ending the way it did… Hidden City was a delightful read that creeped me out and delighted me in that special way that only some books can. If you like your books a-typical, your urban fantasy not filled with love-sick werewolves and/or vampires, and your fungi of the dangerous kind, given Hidden City a try. It won’t spore you wrong.” – Sci-Fi & Scary. “Poisonous fungi? Check. Murderous transformations? Check. Deep-down, bad-to-the bone evil? Check. Good old-fashioned horror? Check. Enter Hidden City at your peril.” – Angela Slatter, World Fantasy award-winning author of The Bitterwood Bible and Other Recountings. “Creepy. Visionary. Catastrophic. Apocalyptic. These are words occurring frequently in discussions of horror. But Alan Baxter’s Hidden City encapsulates them all to an unusually high degree. His protagonists, including the sentient city of Cleveport; his multi-level villains; his dark, rain-soaked landscape, inimical to all attempts to understand and defeat an unseen enemy; and the enemy itself, unfathomable and ubiquitous—all embody the best of familiar tropes and make them newly horrific.” – Collings Notes.